Hovind’s Sovcit Man Hansen – Practicing Law Again? – Kent Hovind v. Robert Baty – The Great Debates! Home→Hovind’s Sovcit Man Hansen – Practicing Law Again? 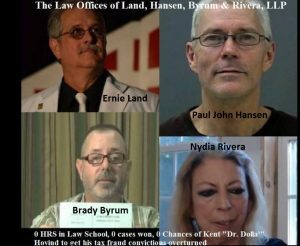 Hovind’s Sovcit Man Hansen – Practicing Law Again? Paul John Hansen, Kent Hovind’s business associate and sovcit authority and convicted co-conspirator, appears to be back in the business of practicing law without a license and boasting about his exploits; this time on behalf of another tax cheat who was convicted after Hansen’s show-boating. Maybe we will hear more of this. Report from PAUL JOHN HANSEN! 8-6-2016 – Mark Laskowski spends close to 2,000$ getting me, and various documents, and challenges, plus 3 days of hotel expenses, to the Federal court case (Federal Northern District Illinois 15 cr 267) in Chicago, and all are blocked, see the story below. Monday 8:45 Pretrial Conference (Jury selection to begin at 9:00). Only 4 people as observers. Judge enters, all rise, calls the case, Two US Attorneys on right side, Marks “desired 6th Amendment counsel on the left side, acting as Representative Attorneys against Marks will, standing on left side. Judge notices the record that Mark sent her a letter. (She did not disclose that the letter implied he he gave 50,000$ to one of her favorite charities and that he was not a US citizen and did not consent to the jurisdiction of the court.) She said she was much concerned that Mark is not in agreement with his bond release terms. She then called Mark, Mark walked forward and remained silent even after the judge asked him several questions, then at about the fourth question Mark raised his right hand, Judge asked question again, Mack remained silent, raised his right hand, then judge announced that Mark is raising right hand but remaining silent, Mark then spoke saying; “you are you, I am Mark”, this mark did to the next ten, or so questions, eventually the judge said that Mark has chosen not to have counsel and trial will begin and she announced that they will now go into jury selection. marshals rushed me threatening to use force to remove me if I did not go out in the hallway, there Mark was telling all that I am his 6th Amendment counsel, Marshals ignored. Mark asked his counsel to do something, he refused, the kicked me off the property to the center of the street and said I will be arrested if I come back. I eventually got the head Court Security Marshal to come talk to me he said I must have state approved I.D. To come back on the property. I said the judge said she had no problem with my attendance provided I remain quite in the public gallery as an observer only. Recording > soon to be added. asking her to take judicial notice of the 6th Amendment of the US Constitution Bill of Rights, she refused, he asked for my aid on the record no less than five times during the proceeding, stating that I am outside the courtroom waiting for permission to enter, Judge said it is up to the Marshals. Mark had no skill, Marks appointed counsel did not subpoena a single witness upon Mark’s demand that he subpoena the IRS agent, or any man that claimed he had a duty to file, or had funds due and owing, and his counsel even failed (refused) to notice Mark of the pretrial evidence hearing, ignoring Marks email to this licensed attorney that he does not wish to allow any evidence in from the Government (Plaintiff), that all must be objected to for grounds of foundation, thus forcing the IRS to supply a witness for all exhibits, to which they have no ability to provide for care, and chain of custody of all such documents is insufficient to qualify as evidence, if objected to as stated, and mark had about ½ inch of documents that he sent to the IRS asking for a 6203 assessment, and notices, and challenges that the IRS must respond to when evidenced . Thus Mark was deprived of a defense, of 6th Amendment Counsel of his choosing, and denied meaningful time, and access, to the court, essentially a fair trial. Mark could have prevailed on all of the charged quite easily if he was allowed his right to have me guide him through the pretrial and trial proceedings. The Government knew of my abilities and made sure I was blocked. Mark now faces five (5) years in a Federal Prison, for not doing a single crime, Mark simply asked, in writing, for the last eight (8) years, that the IRS answer his valid assessment questions before he filed, primarily if he had a legal duty to self assess himself by way of a IRS 1040 tax form, and if not he always asked the IRS to provide him with a 6203 assessment, as the US written law requires (USC – Title 26-6203). One sure thing is that the US marshals were instructed to get “HANSEN” out of there as soon as possible, anyway possible, legal or not. So get this the judge said I was ok, the Marshal said no. Said I could go back in “if” an Attorney comes and gets me, or subpoenas me, to which Marks “appointed counsel” which he took saying; “being you are refuse Hansen to be my 6th Amendment counsel I have no choice but to take one of yours, but Hansen is my choice that you are denying me”, said he will not help him to get this Hansen guy in. A common law court of record my be used to get damages from all who violated Mark’s, and Hansen’s rights. Sentencing is set for 11-6-2016, Mark is out on bond. Laskowski was convicted last week and is awaiting sentencing and further legal antics by Hansen & Co. Maybe some paper terrorism consistent with his sovcit theology. Focus on the red letters below. “American” is by right, “US citizen” is consent to subjection, governance, by congressional written law. Oral oath is the only way there. One can only be a US citizen by birth until the age of 18 “if” their parents were US citizens, then one must take the oath personally, the oath is contract law, not general law, “consent of the governed”. host of documents that appear to relate to his “sovereignty” defense. to the court’s jurisdiction, that objection is overruled. Defendant is reminded that the “sovereign citizen” defense is meritless. American law” (internal quotations deleted). Civil Procedure or Rule 49(c) of the Federal Rules of Criminal Procedure. document is enclosed, please refer to it for additional information. visit our web site at http://www.ilnd.uscourts.gov.